Do Pups Love Apples? 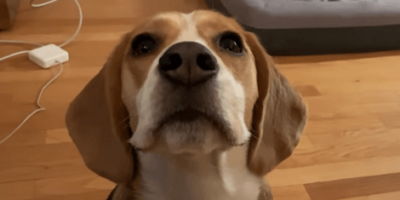 Watch How This Adorable Pup Excitedly Munches On One! We are all probably very familiar with just how greedy pups can be. It seems like their stomachs are a black hole, and their hunger can never be satisfied! At least all that food motivation helps us with training them. But just how do your pups eat the snacks and treats offered to them? In the case of Oliver the Beagle, the answer is very, very delicately. Oliver absolutely adores eating apple slices as a snack every day. It is one of his favorite fruits! It is well known that Oliver is a gentle pup, but in this video, Dad wants to take a moment to show just how gentle he can be! The video starts with Oliver already having his eyes on the prize. Here he already proves himself a very well-behaved pup, sitting down patiently even as his lip-licking gives away just how eager he is! When he finally gets his apple slice, he is surprisingly gentle with the way he takes the fruit with his teeth! Do Pups Love Seafood? Well We Don’t Know About The Rest But These Pups Do! These Adorable Pups Are Dressing Up As Bride And Groom! They Look So Cute!